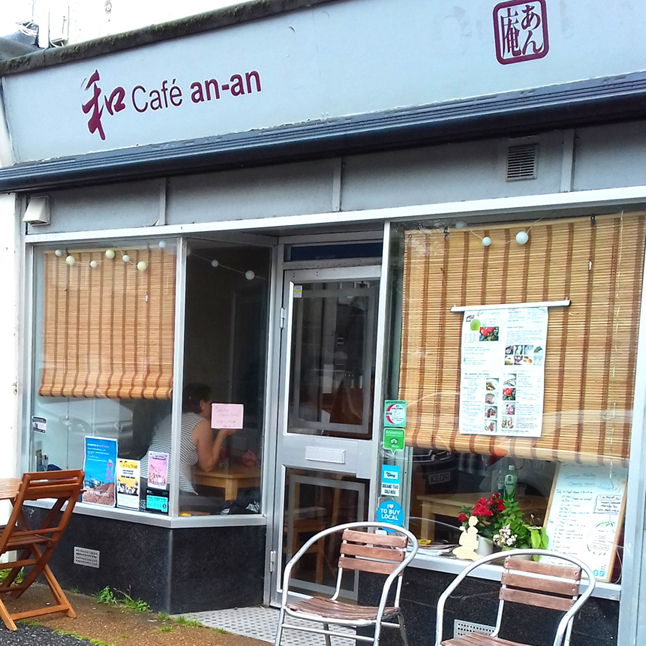 When I discovered Café An-An online, it first stood out to me because of its trip advisor reviews; every single one has given it five stars and commented on how authentic the food is. It also specialises in wagashi, which since visiting Minamoto Kitchoan I have become quite fond of. So I had to find time to visit this tiny café at some point. The café only normally opens only at lunchtimes during the week and also Saturdays during the summer holidays (they are closed Wednesdays then instead). My husband and I found ourselves heading to Portslade on possibly the dreariest, rainiest August day I can remember. Parking on the street a few steps away from the café was easy. I think this is easily the smallest café I have ever seen. Comprising just two main tables inside and a kitchen even smaller than my own, what is immediately obvious when you step inside is how welcoming this place is. Possibly this is because of the owner, who greets you warmly like you’re an old friend. It is also cosy and warm, welcoming, the sort of place where even the other customers say hi as if they know you. Despite the poor weather, while we were there, there was a steady stream of customers- many of who seemed to be regulars, which speaks volumes for the quality of the food on offer. 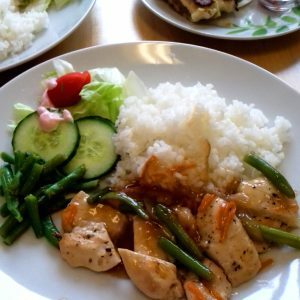 The menu is small but contains all the well-loved Japanese favourites- katsu, teriyaki, sushi and yakisoba, all very affordably priced- our meal including drinks cost £14. They have a selection of lunch sets, where you get a choice of dishes plus rice and salad, and we both choose these; I went for teriyaki chicken and my husband chose chicken katsu. We also ordered chicken gyoza as a side. I was pleased to see that they also had a range of Japanese drinks, including both mine and my husband’s favourites- aloe vera drink for him and Ramune for me. Everything is freshly cooked, but even so it didn’t take too long for our meal to be served. The gyoza tasted amazing, with blackened crispy bottoms and a dip that tasted like my favourite chilli bean sauce (toban djan), which worked together perfectly. 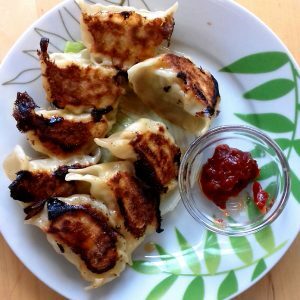 I think they are the best gyoza I have ever tasted. The food was the perfect amount for us for a lunch. 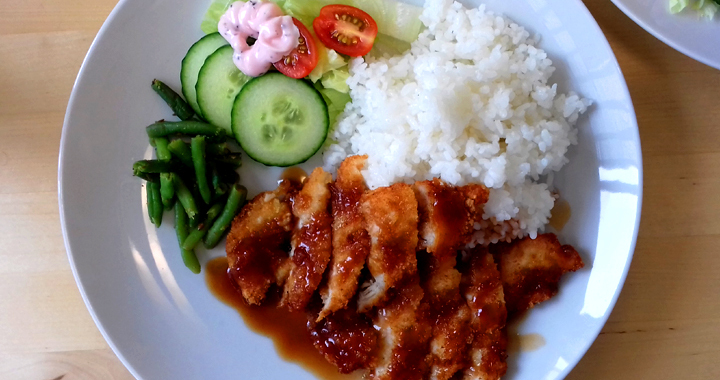 The katsu and teriyaki were very tasty and the rice the perfect mix of fluffy and sticky. They were served with a side salad with a tasty purple dressing. Other reviewers have stated this food is very authentically Japanese. I have never been to Japan, but the food had that classic mixture of tasty simplicity which I love about Japanese food. 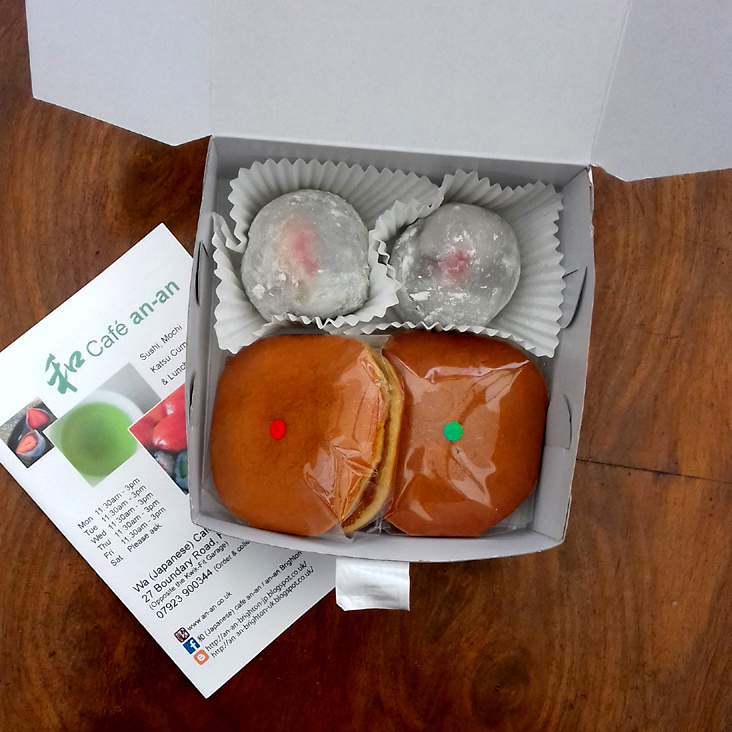 There was a counter of handmade wagashi at the till and I bought four to take home to try; two of their strawberry mochi and two dorayaki, one green tea and one red bean paste. Later in the afternoon back at home I tried the mochi with a cup of tea. 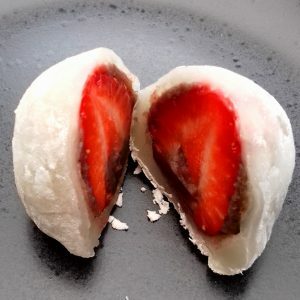 It actually has a whole fresh strawberry inside, surrounded by sweet bean paste and the traditional rice paste. The addition of fresh fruit against the sweetness of the bean paste and blandness of its outer skin makes this by far the nicest wagashi I have tasted. 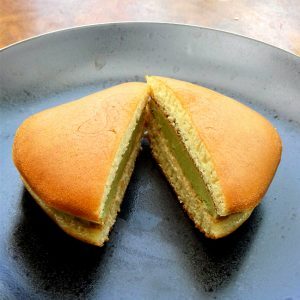 I tried the two dorayaki over the next two days. Both were really tasty but, surprisingly to me, the one I much preferred was the one with red bean paste. I am not usually such a big fan of red bean paste when it isn’t combined with other flavours. However, I found this dorayaki was sweet and tasty and because it was a chunky paste with bits of red bean in, it had more texture, which I really enjoyed. The pancakes halves of the dorayaki were really tasty too- I highly recommend trying the wagashi if you visit here and I will definitely be back because I know that they change what they sell each season! 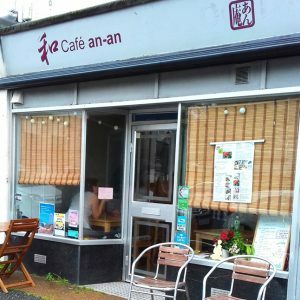 If you live near or are visiting Portslade or Brighton, Café An-An is well worth a visit. It is so unusual to find a place like this outside of London and the small space and laid back, friendly atmosphere really add to this quirky little eatery. Posted in Restaurant Reviews, Reviews and tagged Cafe, Lunch, Reviews, Sussex, Wagashi.